Hortus Camdenensis | Gladiolus liliaceus Houtt. A variable cormous perennial which bears only three, very long, narrow leaves to each shoot, with stems of 1-6 brown to russet to pink flowers, with pink, red or purple specks. The flowers change to a blue colour after sunset and back to yellow as the sun rises. Intensely fragrant in the evening. To 70cm. [RHSD, CECB, Hortus]. Rarely cultivated now. 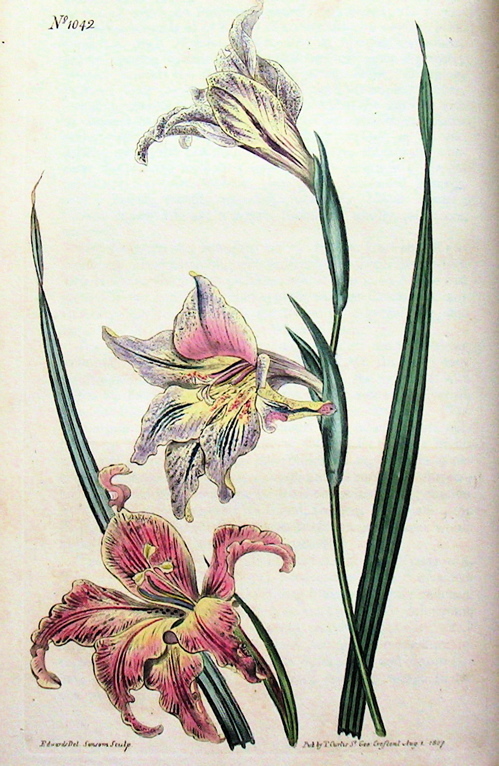 ‘[Gladiolus versicolor] might, like the camelion [sic], equally be a subject of contention to those who have seen its blossom at different periods of the same day; for strange to tell! it is brown in the morning, and continues to change from that colour till it becomes light blue by night.’ It was introduced by J. Pringle of Madeira in 1794, through the nurserymen Lee and Kennedy. [ABR pl.19/1798]. ‘[Gladiolus versicolor tenuior] seems to be the intermediate species of Gladiolus tristis and G. recurvus of Linnaeus (the latter of which which is Gladiolus carinatus of Hort. Kew. and punctatus of Jacquin); from the first it differs in not having quadrangular leaves, from the last in not having ribless ones, from both in the proportionately longer outer valve, besides slighter diftinctions. The name of versicolor was probably given to variety alpha from a slight change perceptible in its colour after sun-set, proceeding from the difference of light: in our variety this is not at all observable. Our figure was taken from a plant at Messrs. Grimwood and Wykes's, who are pretty certain they raised it some time ago from Cape seeds, but it never flowered till this year; perhaps when the bulb is stronger and older it may approach nearer to var. alpha or may prove a permanent variety; scarcely a distint species?’ [BM t.556/1802]. BM t.1042/180. First recorded in an Addendum to the 1843 catalogue and in all subsequent editions [B.171/1843]. More details about Gladiolus liliaceus Houtt.